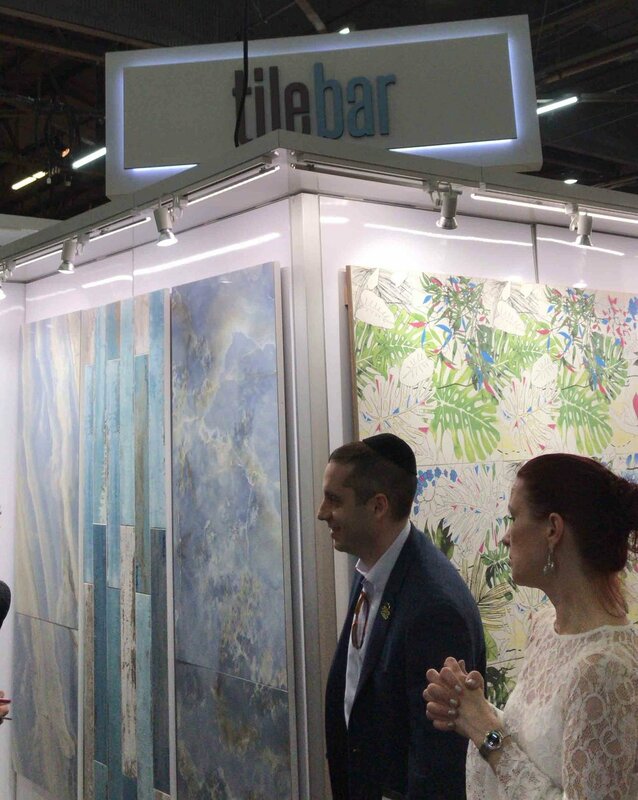 In this post, we will share with you our favorite Tile and Art vendors from the Architectural Digest Design Show this weekend. There truly was so much to see at the event which is why we are sharing it in chunks rather than in one post. This way you can consume a bit at a time and click on the links to the websites and maybe add a vendor or two to your go to list! Let's start off with one of my go to tile vendors TileBar located in NYC. Their tile is Contemporary, Glam, Sophisticated and Fashionable all rolled into one! I absolutely LOVE that they collaborate with designers to bring newness and a fresh eye to the market. These are just a few of the Designers they have worked with! I was really interested in seeing the Elizabeth Sutton Collection which I had seen previews of on Instagram. I must say this designer did not disappoint. I especially loved the butterfly tiles! How original?! Be sure to check out TileBar on line and order samples for your next project! Another one of my favorites is Artistic Tile. They also have gorgeous tile and never disappoint! Check out their website for more stunning beauties! Artistic Tile is a family-run business, offering thousands of stocked tile and natural stone products for immediate delivery, as well as in-house design services and complete custom capabilities. Here is a view of their beautiful showroom at the NY A&D BUILDING. Anahi DeCanio an artist from Long Island had beautiful pieces at the AD show. Anahi DeCanio is a multidisciplinary artist using mixed media, photography, collage as a form of expression. Her influences are as varied as the art she creates. Born in Uruguay, DeCanio came to New York as a child and felt immediately at home. Her pieces are inspired by nature as well as urban settings. Her complex abstract landscapes encompass layer upon layer, each awaiting exploration. As viewers dive deeper into the works, subtle details that might have been missed upon initial glance are unveiled. Graffiti like elements and text, in combination with Zen and gilding with occasional collage elements produce a vibrant energy creating unexpected arresting works. SAMANTHA SANDBROOK ART & INTERIORS one of the many unique artist at the show. Samantha’s style marries playful yet luxurious design with an impeccable attention to detail and craftsmanship. Her distinctive style juxtaposes refinement (swishing haute couture dresses, the luxe use of brass) with rawness (graffiti, industrial parts) and leaves fairy dust floating in the air. She uses vibrant color to highlight sophistication and glamour, often employing candy-like colors and contrasting textures to enhance the visual effect. Every piece has a brilliant metallic moment. Her work dances with playfulness, blending glamour and beauty with levity and whimsy. Samantha’s sculptural pieces, wall installations and paintings are glistening jewels, the focal point of a home. Elizabeth Chiles Studio had beautiful colorful pieces of art! Elizabeth Chiles is an artist based in Austin, Texas who makes abstract photographic collages, natural pigment paintings, video and writing. Her work explores intersections of the physical world and the personal worlds we embody and experience, weaving cosmic, geologic and human time scales and embracing the wonders of existence. Tempaper self adhesive, removable wallpaper which I love and can’t wait to use in an upcoming project was on display at the show. Tempaper launched into the lifestyle and home décor market as the first removable wallpaper in NYC in the spring of 2008. Its one-of-a-kind utility and trendsetting designs quickly made a name for the product with the brand’s first appearance in the New York Times Style Section. The brand focuses on launching innovative products, chic collections and partnering with prominent designers that share the same vision. Tempaper is dedicated to using state-of-the-art materials that are 100% made in the USA and nontoxic. Tempaper is perfect for DIY projects including but not limited to: dressers, stair risers, cabinets, bookshelves, drawers and headboards. Let your imagination be your guide when decorating with Tempaper. We put the Booth & Williams books in with the artwork because they are really beautiful with the many color and theme options. Booth & Williams wraps luxury spaces in the natural beauty of authentic books, supplying hotels, office buildings, studios, retail showrooms and residences throughout the United States and around the world. We process over one million books each year which enables us to rapidly fulfill orders of all sizes. Our BOOKLOOK COLLECTION features 90 precise shades of authentic book color sold by the linear foot. With choices ranging from Antique Boxwood and Vintage Denim to Midcentury Granite and Modern Seafoam, homeowners and designers can now order decorative books in any quantity as easily as they order paint. Customers can shop our entire product line on boothandwilliams.com by color, content or style with no minimum order. Our design team is available at 1.844.4.BWBOOK or design@boothandwilliams.com for free assistance with custom projects. Lastly we loved Forbes & Lomax ‘s Decorative Light Switches and Outlets. Check out their website for more information. We still have more to share so stay tuned for upcoming posts covering the Architectural Digest Design Show 2019! That said as always reach out to us HERE so we can help you create a space that makes you feel inspired and rejuvenated when you come home from a long day of work!